While the funk fans go for the rather obvious “Funk On” I much prefer the more reflective ballad Want To Thank You. I like the carefully constructed chord changes and the tasteful electric piano as well as Harris’ gentle but emotional vocals. Even the occasional synth strings are acceptable. 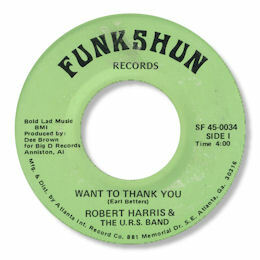 This 45 was produced by Dee Brown in Atlanta, GA. Note – this is a completely different artist to Bobby Harris.